As a former money market/foreign exchange dealer I grew up in the business on M3. I recall back in the late 1970's when we would sit around on Thursday's awaiting the Federal Reserve's weekly release of the Money Supply numbers. The market would centre on M3. The Bond market and the Eurodollar market would soar or plummet depending on how much M3 grew on the week. Volatility was the name of the game and one could make or lose thousands or more of dollars if you correctly (or incorrectly) surmised the weekly money numbers. As the years went by the weekly money numbers lost some of their aura as they began to target bands of growth or focused elsewhere rather than on the monetary numbers. Still it was never forgotten and dutifully I would go and check the weekly releases to find out how much money supply grew. Old habits die hard. Note: These are the US definitions of M1, M2 and M3. The Bank of Canada's definitions of M1, M2, and M3 may vary. While M1 and M2 are measurements of money that are held for the most part by the general public M3 adds the huge institutional funds to the equation. These funds are generally the most liquid funds. It does not capture all of the institutional funds but it does capture an important part of it sufficient enough to measure the growth of money in the financial system. It is M3 that has experienced the most explosive growth in the past decade. Since the end of 1995 M1 has increased a paltry 18.8% while M2 is up 89.5%. But M3 is up 130%. GDP by comparison is up roughly 67% in the same period so M3 growth is almost double GDP growth. Consumer debt has grown about 123% in the same period or about equivalent to M3 growth. Business debt is up 97%. It has taken an incredible amount of debt and money to obtain GDP growth over the past decade. This is monetary inflation at its best. I have never paid a whole lot of attention to M2 and even less attention to M1.In the broader scheme of things they were just not as important as M3. 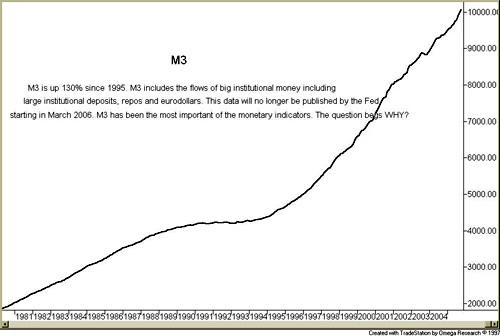 Only M3 told us what was really going on with monetary growth and the big money is in the institutions. If the stock market started to jump sharply even though neither the economic situation nor the economic outlook shifted substantially one could look over at the monetary numbers and depending on how they grew get a good idea why the market was rising (or falling if M3 growth was exceptionally sluggish). One certainly didn't rush to look at M1. Noting that M1 grew a paltry .7% in the latest 13 weeks was not significant. While M2 up 5.2% told us a bit more we had to go to M3 and find it up 10.1% in the latest 13 weeks. There is serious money and all that money goes somewhere. The stock market has soared recently. The last time M3 was actually negative was in the early 1990's and if one recalls it was the last time we had a serious recession. Since 1995 M3 growth has soared and this corresponds with the period when the Federal Reserve under Alan Greenspan decided to effectively print their way out of the recessionary early nineties. One writer (Recently announced reporting changes at the Fed - Captain Hook, November 18, 2005 on 321Gold) compared this move by the Fed to Nixon's closing of the "gold window" in August 1971. It might be although the ceasing of the publication of a widely watched monetary number does not quite compare to a default which is effectively what the US did when they closed the "gold window". But given the importance of M3 to market watchers we do have to wonder at what the Fed wants to hide. As Captain Hook notes "we just got another "big signal" from US monetary authorities that the rules of the game are about to be changed fundamentally, once again. " And the results might be the same. Indeed an examination of gold shows that that gold made a low November 4 near $456. By the time of this announcement Gold had climbed back to $470. Then 3 days later gold leaped and it has been on a tear ever since. This has come despite the recent rise in the US$. Indeed gold prices have been rising now for several weeks despite the strong performance of the US$. 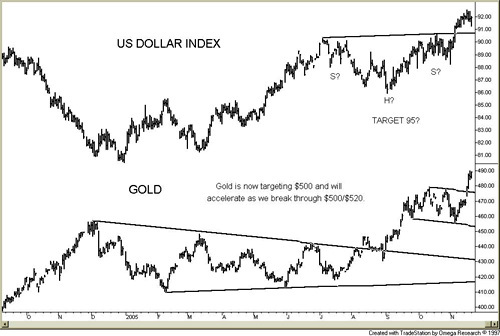 While it is possible that the US$ has a target zone of 95 based off what appears as a head and shoulders bottom it is not slowing down the recent jump in gold prices. Putting aside demand/supply conditions that favour gold right now the recent sharp jump in gold prices can only be explained in light of a realization that a monetary disaster is in the making. 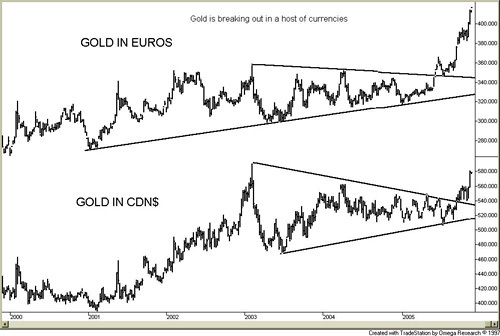 Gold is or has been breaking out in a number of currencies recently as well. Gold is the ultimate currency and when it is going up against all currencies it is telling us that something big is going to happen.